Aloo baingan sabzi is one of my favorite vegetable and best thing about this very easy to make and that any way you make it, it turns out so good. Ginger julienes ( cut into thin strips) for garnish. 1.Heat Oil in the pan and add the Jeera seeds ( Cumin Seeds) and stir they become brown..
2.Add the garlic pasteand Ginger paste. 3.Then Add in the chopped onions and fry onions until they are golden brown. 4.Add the chopped tomatoes and fry until the oil starts to separate and the tomatoes are soft. 5. Add the turmeric powder and the Garam Masala and stir for a minute. 6.Add the Jeera Powder and stir for 1/2 a minute.. Add the Coriander powder and stir for 1/2 a minute. 7. 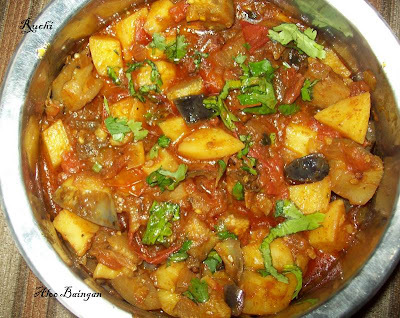 Add the potatoes and fry for about 5 minutes.. Add the Baingan pieces and fry further for 5 minutes. 8.The potatoes and the Baingan will still be hard so add 2 cups of water ..
9.Let the water get a boil and then lower the heat.. Stir the mixture and cover and let it cover on low heat. 10After about 5-8 minutes of cooking check if everthing is cooked otherwise cover the pan and let it cook further. Nice and delicious recipe. looks perfect..
very true- potato & eggplant is a nice combio and this curry looks good ! Haven't tried this combo yet. Two favorite veggies combo! delicious!